We’re continuing our 3 month discussion of the popular Give Them Grace: Dazzling Your Kids with the Love of Jesus (Crossway, 2011) by Elyse M. Fitzpatrick and Jessica Thompson in the Family Discipleship Facebook group. If you missed the discussion of the foreword, intro, and chapter one, you can find that here, chapters two through four here, chapters five and six here, and chapters seven through nine here. I’d love to hear your thoughts—here and on Facebook. Below is the schedule we’re following in the group; we’re just about done! I have more exciting news this week. Wonderfully Made, a picture book I wrote on human en utero development, will be published with Christian Focus 4 Kids. It’s being illustrated right now! I’ll let you know when it becomes available. I’m going to let you in on a secret. I feel guilty in parenting. A lot. Often. It’s something I take to the Lord, analyze, and discuss with my husband endlessly. I know he loves that. He is truly a patient, enduring man. I’m thankful he endures me. The authors of Give Them Grace blame parenting books (ironic, right?). Here’s the truth: a hundred years ago, if your kids grew to love Jesus and survived early childhood, it was a blessing. Today we have so many rules. There is so much we must do to be a good parent. Enter the mommy wars. But parenting isn’t about us. It’s about pointing our babies to Jesus and then setting them free to go into the world, knowing who Jesus is, a little at a time. We have to trust our Lord with our kiddos — we are, after all, only stewards of our precious children. Oh, amen to that, sisters. Amen. What did you get from chapter ten? How will your parenting change as a result? The authors share the gospel in a charming story format. I think this would be a neat read-aloud for kids. Did The Good Story present the gospel in a way you had not considered it before? Do you have any questions? This appendix contains a series of common parenting problems (hey, friends, these issues are common to all parenting! ), and run them through the authors’ Management, Nurturing, Training, Correcting, and Promises of the Gospel paradigm. They address lying, blame-shifting, disobeying, provoking others, fighting/anger, complaining, talking back, and laziness. These are interesting to read through. Elyse M. Fitzpatrick shares her testimony of how Christ called her to salvation and walks through the gospel with Scripture. This is worth reading. What do you think about the end of the book? Comment below, or join the discussion at the Family Discipleship Community with admins from six blogs committed to family discipleship (in no particular order): Me (surprise! ), Tauna from Proverbial Homemaker, Amanda – owner of Kids in the Word, Ticia from Adventures in Mommydom, Anne Marie of Future Flying Saucers, and Joyice from Raising Boys Homeschool. I look forward to continuing the discussion, friends. 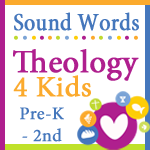 Check out Sound Words ~ A theology program based on the Westminster Catechism from Proverbial Homemaker!